All Winter Trips Posted Via Email. There's just no use trying to go everyday in winter..
Last Sea Bass Trip - Thursday, December 29 - 6:30 to 3:30 - $125.00..
Tog Fishing Wednesday - January 4th - 7 to 3 - $110.00 - 16 Sells Out. Will be scheduling some Long Tog trips soon. My Crew Have (usually have!) White Crabs For Sale AT THE DOCK for the low, low price of just $5.00 per generous dozen. There Is No Guarantee We'll Have Whites For Any Trip. Sometimes they all die. That shrinkage is why I prefer greens. We may be bringing some whites with us in the ocean. Green Crabs (not Whites!) 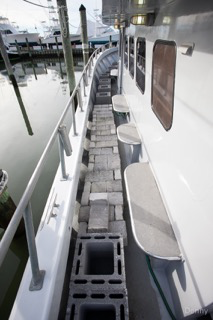 Remain Provided As Boat Bait And Are Included In All Fares. Going Toggin Anyway! Tog Only, Sea Bass Are Closed Because NOAA Has Absolutely No Real Idea* How Best To Manage The Fishery. It's Simple To Prevent Motion Sickness, Difficult To Cure. Bonine seems best because it's non-drowsy. It's cheap & effective insurance. Support the Ocean City Reef Foundation! http://www.ocreefs.org (lots of reef pics here..) Also registered w/Amazon Smile. We're Nowhere Near Reef Building's True Potential. Thank You! Two Upcoming Reef Building Trips - Wednesday, December 28th at 9AM to (probably 1ish..) & Saturday, December 31st also at 9AM. Volunteers Wanted. Email mhawkins@morningstarfishing.com if you'd care to help. Boots & leather gloves; strong back/weak mind needed.. Idle hands do the devil's work! Pulled the plug on sea bass tomorrow - calling for wind gusts over 40. Fugedabotit..
For later perhaps, YouTube suggested this video. How personalized..
"How Big Is The Ocean" - Modestly Geeky Oceans Description. Some surprising info. Also on Facebook now.. Sheesh. Spend enough time on a computer. Do not understand Likes yet. Learning. Search Morning Star Fishing or https://www.facebook.com/ocfishing/ if you enjoy the venue. I've been caught in the turmoil of fisheries management many times. Am right now in fact, but have adjusted to it as humans do under stress. The worst of our ongoing regulatory storm, at least in the Mid-Atlantic, is up north with summer flounder--aka fluke. While those players hash it out with state & federal regulators; down here Maryland has "regionalized" with VA & DE. Not sure that's how it will remain. Is now. Regionalization seems to be working. We'll have some increase in flounder regs, a tightening for sure. Owing to low catches, however, (as estimated by MRIP,) we'll not likely feel too much pain. Because we undershot recreational quota, there's a buffer. It makes absolutely no difference if not a single soul believes the information MRIP provided regulators was correct - their formulaic response is required. But because we're now combining our catch totals with VA & DE, there's more likely room for an MRIP spike before regulatory catastrophe sets in. What regionalization SHOULD do is recognize biological separations & signals. In other words, management should be built around biological centers of production. The NJ/DE state line, for instance, cuts right up the center of DE Bay. Two states - two sets of regulations. And NJ & DE flounder regs are widely different. If management were biologically based, however, Delaware Bay flounder regs would be uniform and based on the population of fish in DE Bay with no conflicting signals from that part of New Jersey shared with NY. Regulators fear cutting management zones into biologically-based pieces would run up complexity, especially if the pieces became too small. What we're seeing now in flounder is regionalization owing to management's need of a regulatory buffer from spikes in MRIP -- a 'shock absorber' from statistical mayhem -- bad data creating want of a complex repair..
That's also part of what I anticipate we're about to see with sea bass. No crystal ball & no slam dunk, this is informed speculation on my part. It does appear that sea bass population estimates, (what are called stock estimates,) have suddenly begun to reflect a population explosion up north. Always "Coastwide" previously - a stock assessment previously meant there were X pounds of live sea bass north of Cape Hatteras. Now it seems as though we're likely to see a split in the Mid-Atlantic sea bass stock estimate - northern & southern zones. Going to be some complex & hard-fought management. Very early in my work with ALS tags, in the early-mid 1990s, (yes, you can tag too! http://www.littoralsociety.org/index.php/take-action/citizen-science/28-fish-tagging/83-fish-tagging ) I saw "Habitat Fidelity" in sea bass - then tautog. Sea bass return to the same reef to spawn every summer. I think there may be an "I've had enough of that crap" population component offshore too, but that's after a sea bass has spent years making a sudden spring run inshore and a slow meandering offshore in fall. Seems like bigger fish in the deep, yet not as many smalls as would be required to maintain a population of large cbass compared to nearshore reefs with low pressure. No sea bass from VA near the mouth of Chesapeake Bay will be caught off Hatteras, nor a sea bass off Cape Canaveral, Florida be caught off Georgia. Sea bass from Massachusetts are as isolated from New Jersey's as Tampa, Florida's are from VA Beach. In fact, spawning site habitat fidelity is so well defined in sea bass that a well-known wreck (fished hard) can have an entirely different population of fish, more diminished, than another wreck, but little known, just a couple hundred yards away that's absolutely loaded.. Yes, I'm positive. There are numerous instances of exactly that happening in the fishery. Any skipper with a couple decades should be able to describe instances of fidelity like that. From those early sea bass tag returns & all returns since, & from every tagging program too; each show management's need of regionalizing sea bass regulations & quota. The MAFMC broke recreational sea bass into state quotas just a few years ago. They had long since broken state commercial quotas out. That's how Maryland's commercial sea bass quotas are further divvied into "Individual Fish Quotas" or IFQs..
Now, owing to waters warming just a touch below Cape Cod & a regulatory strangling of that region's nascent sea bass fishery, the Long Island Sound to Cape Cod population has skyrocketed ..but with no benefit to any fisher, and likely an over-pressuring of ecosystem resources. With facts finally overwhelming the initial convenience of early management, & those errors of convenience having been compounded by MRIP's misinformation; it now appears as though we'll see an increase in overall quota & a regional split.. Perhaps NJ south & NY north? It all has to get hashed out. But it should, finally, create relief for both our southern sea bass fishery and theirs. My greatest fear is quota split being "Landings Based" only, especially for commercial winter trawl. Because there's a true biological need of recognizing sea bass spawning site fidelity; and that they school together in winter too, tighter--but from similar geographic area; any new regulation must be careful to guard against use of northern quota on southern fish. If, say, Rhode Island and NY trawlers took all their assigned northern quota from the Baltimore Canyon & Cape May Rocks in February; DE, MD, & southern New Jersey anglers would see a dearth of sea bass come spring -- and still have southern quota removed from a now-diminished population. We've needed to split into regions to better refine management since management of sea bass began. If biological necessity isn't soon calculated, we'll learn yet another lesson the hard way. Tired of the hard way. The path to real sea bass abundance, & economic stability for fishers, is made plain in fishing's history. Ought to make use of it. ..unless we get a multi-state MRIP spike. Yup. Good old MRIP recreational catch estimates could even screw regionalized management up. Be interesting to see what the National Academy of Sciences has in their MRIP report. With a project duration of 18 months, it should be out in 2017. Hope everyone had a fine gift-giving holiday & is looking forward to the New Year.